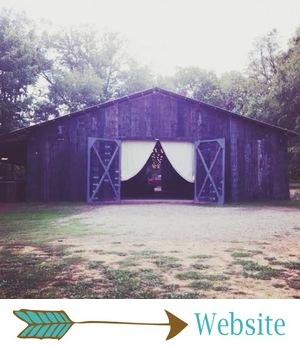 Y'all already know all about our fabulous weddings and elopements, but did you know we host tons of other types of events throughout the year too?! We host charity events, holiday parties, baby showers, and we recently even had a romantic anniversary dinner for one of our past couples. When this sweet couple, who have been married for TEN years, asked us about a vow renewal, we basically screamed YES! Ali and Chris and their two kids are the most precious family, and it was an honor to celebrate their beautiful marriage with them. Cheers to 10 years, you two! We absolutely love these romantic photos by Karyn Hall Photography! Ali and Chris have been married for ten years, and they celebrated their beautiful marriage and renewed their vows at The Barn on June 8, 2018. Their colors were light pink and pastel blue, and their details were rustic and fit right in with the details of the Twin Oaks Ranch! "We love the ranch life, so we knew we wanted something that would include this but also be very romantic," Ali said. Ali's bridal gown, which was from Low's Bridal, was absolutely stunning! The trumpet silhouette was made for this woman, y'all. Ali, you are such a gorgeous bride! She said one thing she would always remember about this day was something that happened while she was getting ready. She realized while getting her hair and makeup done that she had forgotten her boots at home, so Lesleigh (The Barn's owner and creative director) offered up a pair of her own... "But I just decided to go barefoot," Ali said. We always love a barefoot bride! Umm, have we mentioned how much we LOVE a cowboy?! Chris was such a handsome groom! Ali's bouquets and florals included a beautiful blend of their color palette, and they were the perfect florals for a rustic, summery wedding! Ali knew she wanted loads of hydrangeas, light pink roses and baby's breath. "My bouquet was full of it all," she said. "It was very full, so beautiful, full of everything I had asked for." Ali's daughter was her maid of honor, and Ali said her bouquet - a combination of light pink roses and baby's breath - was "very simple, but perfect for her." That dress though!!! This bride and her cowboy... it seriously doesn't get prettier than these two! My favorite photos of Ali and Chris's vow renewal were these sweet ones with their kids! This family is so adorable, and we always love it when our couples include their kids in every aspect of their big day. Their little cowboy is melting my heart! Ali and Chris’s intimate, romantic, rustic ceremony was held inside The Barn. They said their vows right in front of The Barn's famous front doors, with ranch-style details that included hay bales, steer heads, beautiful florals, and rose petals scattered on a cowhide rug. Their aisle was lined with wood slabs topped with mason jars full of pastel pink and blue flowers. All of this paired with The Barn's gorgeous drapes, twinkling lights and chandeliers was beyond magical! Ali said her favorite thing about their vow renewal was "the cowboy aspect of it all." Who knew cowboy things could be so darn pretty?! Ali and Chris's son walked Ali down the aisle, and their kids stood beside them as they exchanged vows in front of their closest family and friends. Literally the most perfect, most special day ever. When I asked Ali how her experience with The Barn went, she said: "Outstanding!! Lesleigh asked me early on what my vision was, and I honestly was all over the place. I didn't have a vision. I knew what I liked and didn't but wasn't sure how it all was going to come together. Lesleigh and the team did an amazing job! I couldn't have asked for anything better!" We LOVED this vow renewal so much. Married folks and couples from past weddings at The Barn, pleeeease contact us about vow renewals! Let's make this a trend! We're obsessed.